Excerpt: Thirty years ago, I attended my first McCrone Research Institute course in applied polarized light microscopy. 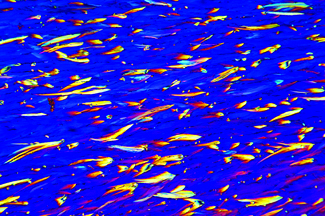 We used the Nikon SK-e, which was already an old model polarized light microscope (PLM). In subsequent courses there was the monocular Olympus model POS, which had an external LSD lamp and illuminator. Most folks like myself didn’t realize it at the time, but looking back now, the SK-e and POS may have been among the better and last well-built functional PLMs. They were also ideal for learning. The course I took is still taught at McCrone today with different, though not necessarily better, microscopes from a variety of manufacturers, all now more than a few years old. The course syllabus has not changed much. It generally covers no polar, single polar, and crossed polar techniques, which can be traced back to, at least, the classroom of Professor Émile M. Chamot at Cornell, and Dr. Walter C. McCrone in Chicago after World War II. One thing remains the same, the PLM. Well, sort of. 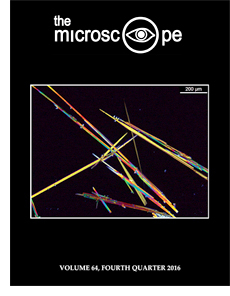 Summary: Beginning with this issue, The Microscope is publishing selected monographs from McCrone Research Institute’s “A Modern Compendium of Microcrystal Tests for Illicit Drugs and Diverted Pharmaceuticals,” which contains 19 different drugs and their microcrystal test reagents. This installment includes the original research paper, followed by the first four monographs: _d_-amphetamine with gold chloride reagent, _d_-amphetamine with platinum chloride reagent, _dl_-amphetamine with gold chloride reagent, and _dl_-amphetamine with platinum chloride reagent. Additional monographs will be published in future issue. Pocket Microscopy: A Panacea for the Optically Curious or Just a Novel Trend? Abstract: The advancement of low-cost optical technology integrated into mobile devices such as smartphones has driven consumers to use various camera and video recording applications. A recently introduced pocket-size microscope peripheral can be attached to a smartphone to enable limited magnification microscopy. Features, limitations, various images, and some speculations on this trend are presented here. Foods and beverages we enjoy today were developed by our prehistoric ancestors, who learned how to harness microbes as a means of survival. A fusion preparation of Form I (orthorhombic) of the high explosive 2,4,6-Trinitrotoluene (TNT). The sample was grown from a melt (81Â° C) and rapidly cooled to room temperature, resulting in crystallization of curved rods and needles that form a morphologic pattern also known as the school-of-fish habit.